1. Action Wipes – I used to hate carrying around baby wipes because of the smell, but when I need to re-apply sunscreen or chamois butter, I need to clean my skin with something; it is absolutely essential in order to prevent saddle sores, pimples, and general skins problems due to bacteria. Enter Action Wipes. Action Wipes allow you to clean up and reapply, but smell and feel much nicer than baby wipes. In addition, they can be washed (I put them in a lingerie bag, hang dry), and reused a few times; just a couple a spritzes of the AW Sports Spray on a clean wipe, and you’re ready to go again. I’m very pleased to say that Martha of Action Wipes is Sponsoring Team Osprey for the RAAM. Right now, Action Wipes is having a contest, in which you can win a ONE YEAR Supply of Action Wipes: details here! 2. Sunscreen – Time to re-apply. I found out the hard way that applying sunscreen every two hours is absolutely essential in Southern California. All it takes is one time without it, to damage skin and risk skin cancer. My latest sunscreen is a Los Angeles based company which uses all organic ingredients: Coola (SPF 45) . The other sunscreen I like is a dusting powder called ColoreScience (SPF 30) which works nicely when I just can’t deal with any more goopy stuff on my skin. 3. Chamois Cream– I like Assos, but I’m searching for something without parabens. My guess is that the next Chamois cream I will try will be Beljium Budder, IF I can find it. I carry it in a small cream pot. 4. P-Mate – Why? Because I like to wear bibs. Because I don’t like port-a-potties, but I have to use them. Because I like getting rest stops done fast. P-mates have changed my life in this way. ’nuff said. 5. Energy drink powder – If you’re on the road it’s easy to find water, so why carry extra weight? I carry extra powder, and mix it as I need it. As I’ve said, Endurox seems to work well for me. 6. Food- Sure, I could probably find food along the way, but while riding I prefer to eat things I’ve tested and know will not upset my stomach: most energy bars do. But one Luna Bar in Lemon Zest, works for me, so I always have one around for “emergency rations”. These are my consumable essentials; I can’t imagine going out for a 3-6 hours ride without all of the above. The This Changes EVERYTHING Sale!!! Everything in the store is on sale, most items 30% off, some up to 50% off! But hurry, as the SUPER SALE sale ends next Sunday Sept 21. But I also wanted someplace to express my opinions, and also share the wonderful blogs of other women cyclists, share how-to videos, reviews of bikes by women, and reports from the racing seen. Thus, the idea of a Webzine was born. 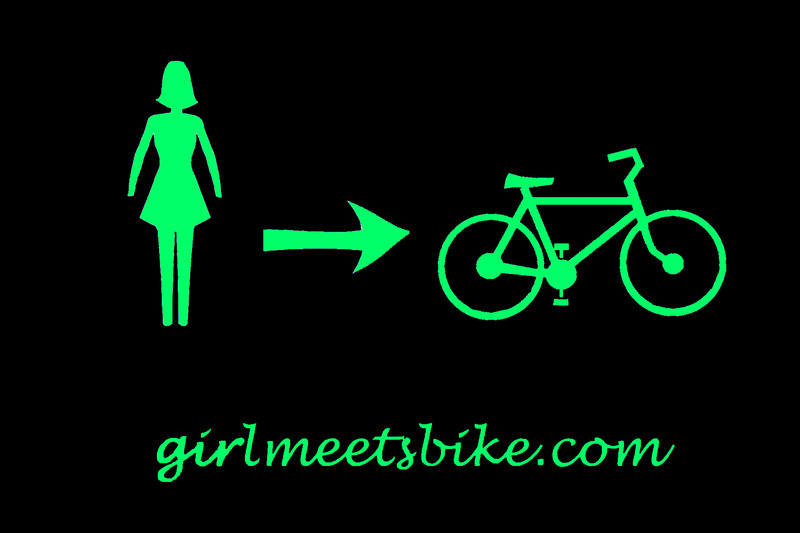 I hope to bring women on bikes all over the world together, to learn more, have fun playing with cycling fashion, or whatever! I hope that these names will be easier to remember, and that the sites are more fun for gals to explore. The Bera Knickers have been around for a couple years, and have become a staple for the Etxe Ondo Collection. But the exciting news is that they’ve now upgraded the pad. They used to have a pad that was similar to many other good women’s chamois out on the market. The Bera Knickers have the same pad as the Oyama, so obviously they are now a dream to ride. I was delighted to see that Etxe Ondo have made a good thing better; they’ve improved their women’s chamois pad so much, that it’s now my new all-around favorite. They’ve put more density in the pad directly under the sit bones, where it’s needed most (and just a few other well needed places). They’ve curved the profile of the chamois pad, so that there isn’t a sudden “step” in the pad. This means that there’s less chance of getting chafed from the “edge on the pad. They’ve put in a channel in the middle of the chamois. This is the most important improvement as far as I’m concerned, as it removes pressure from the place where there are a lot nerve endings. It has made this chamois magnificent to ride. The fabric is a soft light Lycra, making it their summer knickers, and my choice for the many milder winter days we have in southern California. Where the Oyama’s have an elegance to them, the Bera Knickers have a Sporty look to them. The way they cut the knees and leg openings is just remarkable. They’ve sloped the leg opening downward, to make it lay more comfortably on the calf. The end fabric has a criss-cross detailing at the knee to make the knicker leg contour the knee properly while in bike position. This is the most comfortable leg opening for a pair of knickers that I’ve ever tried. Quite inventive and cool looking too. This may seem like a small improvement, but for a gal like me who has unusually large calves, this leg opening is the difference between “constantly annoying” and “didn’t notice I was wearing them”. Since they’ve upgraded the pad in these, they are quickly become my favorite all-around knickers, including mountain biking. These are the best things to wear while cross-country mountain biking; so say many cross –country mountain biking women I talk with. There’s good reason why these are so popular in Southern California. There are so many good things about these, I hardly know where to begin. -They are flattering on just about every figure I’ve seen them on, from extra small to extra large. -They have light and soft outer Capri made of MicroFlex, a SheBeest exclusive fabric. These Capri’s look great once you’ve removed the chamois liner, making them a great candidate for a commuter pant. On summer days it’s easy to slip off the chamois and wear the shell, because the material is soft and light. However, note well that the shells are a light and stretchy fabric, so not for the modest if worn alone. -The MicroFlex material can withstand hard crashes, and thorny bush grabs; the material just does not snag! Claudia Reid, the designer for the SheBeest clothing line, has delighted us with updated chamois, and fresh colors for these Capris each year she’s had them in her collection. And they’ve also always included the standard black, with white stitching (quite nice). -They are the most comfortable Capri for those hot summer months, when you’d like a little coverage on your thighs, but don’t want to wear a tight because it’s too hot. They also keep poison oak, bugs, and stinging nettles off the legs nicely. I’d heard rumors from several women that the RS short from Sugoi was well worth checking out. My problem with Sugoi was that I’d tried a short of theirs a few year’s ago, when they still used seams at the chamois articulation. This caused me horrible saddle sores, causing me to swear off them. Well, gone are those seams, and in its place is one of the nicest chamois for women. They turned to welding the seams (as has most of the market), which is far more comfortable, and less likely to cause chaffing. When I first saw the chamois, well I was hesitant. The step up on the sit bones seemed smart, only if they were very well placed. And wouldn’t the sharp contrast in density and step be felt on the sit bones? Well, the only time I felt the sharp contrast, was while sitting on a regular surface, like a chair. The moment I sat on the saddle, the chamois made perfect sense. So far I really love it. I’ll be interested to see how the knickers perform on longer rides, like a century. The material and the cut are both wonderful. The fabric did not have the best “hand feel” at first (that is, the reaction of how soft a fabric feels when you grab it with you’re hand). It felt, well, a bit scaly, like a small fish. But this is the thing that just tinkles me about highly technical fabric. While on and riding, the fabric feels so nice against the skin, but in a way that’s still hard for me to describe in words (you’ll have to wait for the update review). It does feel lively and responsive to your movements rather than restrictive, as some fabrics can be. The fabric is also the one the newer “dimpled” fabrics. Lately a few brands have utilized the concept cutting down on air drag by creating a dimpled surface effect on cycling apparel (using the same idea as that of a golf ball surface). Sugoi’s Ultra Aero fabric is designed in this way as well, possibly maing this a good fabric for road racing. (I let you know if I’m noticeably faster while wearing these 😉 ). And the cut is a beautiful design. I don’t know how the shorts fit yet (though I’ve heard good reports), but the knickers are amazing. The lines were cut for a real, three-dimensional woman, with real hips, even! The waist is high in the back, and not too low in the front. It has a drawstring as well as light elastic in the waistband, which I find very comfortable. Definitely technical and cool looking. 2- the material is somewhat delicate, and therefore NOT good for off-road. It would not survive the occasional spill one takes while mountain biking. These would probably be great knickers for a charity ride, or some other distance/ multi-day event, or road racing (that did not involve lots of crashing). I’ll submit another review after I’ve worn them for a century. Loeka is a fairly new brand based out of Vancouver. This clothing line is created for and by the female downhill / freeride cyclist. These are serious mountain biking shorts, made seriously feminine. The interior is fully lined with a soft lycra, so no more annoying thigh rub from rough, stiff fabric. The shell is a soft microsuede polyester, making them durable yet supple, and good looking. They have stretch panels in the hips, which helps them to sit correctly on your hips whether on the bike or standing around. Surprisingly, the lining which provides extra protection while mountain biking, is very light material, so even the Capri’s are not that heavy. Still these are what I would consider to be good for a Southern California winter, as that extra layer really does keep you warm. Cross-country riders should ride with liners w/ chamois. The same things that make them great for mountain biking make them great for the commuter as well. I’ve commuted over the mountains, and through city streets in these and felt equally at home, and comfortable. (I use a liner with chamois for anything over 5 miles). The Capri length is a bit more comfortable to me, but that’s just my style. I’d say these are good for just about anything except serious road rides (I don’t recommend baggies for road riding). (Take note that the 2007 version runs one size too small. Try one size up). I was delighted to see that Etxe Ondo have made a good thing better; they’ve improved their women’s chamois pad so much, that it’s now my new all-around favorite. But the Oyama Knickers aren’t just all about the pad. They are all about color blocked three-dimensionally designed fabric to form fit the body in bike position. They are all about EVERY seam being flatlock stitched flawlessly. They are about style, comfort, about feeling pretty and cozy instead of ff-freezing at 30-40 deg F.The fabric of the Oyama is fleeced Meryl, a soft but strong and snag resist material. The fleecing on the inside gives the material enough loft wick sweat away from the skin. This means that when I get caught in the rain in these knickers, my bottom stays warm and dry. Admittedly I haven’t gotten caught in a downpour yet, but I suspect these will hold up fairly well. My experience so far is that it stays warm, even when wet, and dries surprisingly fast. And (thank you) it’s wash and wear. The color blocking on these knickers is downright pretty. I match this with the Etxe Ondo Goiz Jersey, which is cut beautifully to match, and is made of the Thermolite, an Advansa fabric (the same makers of CoolMax Fabric), that’s cozy and fleecy on the inside yet not bulky at all. The outside is hydrophobic, meaning water and rain mostly roll off the exterior like water off a duck’s back. On days that I know I won’t get past 50 F, I wear a Craft Short Sleeve base layer. Until now, grey skies always meant looking dumpy on the bike for me. Inevitably, I’d have to layer with so many layers, that I’d feel (and sometimes look) like the Michelin Man. This outfit is perfect for when I need a one or two layer solution and it’s cold (or windy, or wet). But the fabulous difference is that this outfit says all woman, all over. It is absolutely more comfortable than all those layers, but also, I can’t help but feel like I’m stylin’ when I wear this. AND I’m laughing at inclement weather. Finally, I’M laughing at the weather! I’m very happy to announce the addition of “Totally Tubular Design” Messenger Bags, Purses and Wallets to the Cycle Maven Boutique. 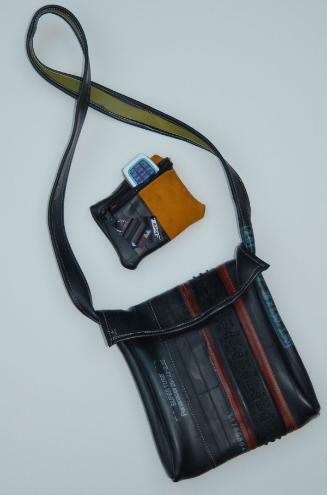 Each bag is completely unique and handmade from – get this- bicycle inner tubes, tires, and other recycled materials!!! These bags make me feel good about being a retailer; I get the opportunity to contribute to a BRILLIANT idea for recycling, support some wonderful artisans, and get to sell some really great looking purses too! These bags are so cool, so fun. I got them in the shop yesterday, and most of the Messenger Bags are GONE already!!! (Don’t worry, I’ll have more in by Wednesday). And by the way, if you have old inner tubes and tires (especially mtb tires and colored tires), bring them into Cycle Maven. We’ll recycle them!!! !